That is indeed a treasure. So much love went in to creating that village and it appears that love still gets unwrapped every year to be shared with everyone. Some years ago, my friend Margaret (landlady of the 1000-year-old castle where we ex-pat Americans were thrilled to rent one tower) took me on a tour of her beloved Durham Cathedral. I asked her why the UNESCO World Heritage site’s spectacular carvings and sculptures had never been restored after 3000 Scottish prisoners (held there by Cromwell in 1650) destroyed almost everything within their reach. Margaret told me that all of the cathedral’s history—good and bad—was part of their heritage, and it was important to understanding who they are today. I was reminded of Margaret’s words when I read KSBETH’s moving post. The things that link us to our past and our identity include both good things and bad, but preserving them helps us to understand who we are. thank you so much, barb and i love that story. you are exactly right. Wow, such a unique treasure! Not only beautiful but also the history and the background makes it so very precious! Thank you for sharing, Beth! the account is quite skillfully written, with an intricate balance in tone and affection and all the right words. Thank you for sharing this memory and thank you for sharing this lovely piece of writing. Delightful – Happy Christmas or do you say Happy Holiday? Wow. What a save. A Christmas misracle that you caught sight of the box. Such a beautiful memory. I love the history surrounding the building of this village. Your grandfather was a skilled craftsman. Handmade treasures are the best. Thank you for the pictures and the story. What an amazing family treasure! I am so glad you rescued it from an awful fate. How blessed you are to discover these family heirlooms. Your grandfather was quite an amazing artist. It’s a shame that you cannot find the answers to these questions. Do you have any elderly relatives that might have some information for you? Poignant story of wonderful historical Christmas gifts for you and your siblings. You have inherited aspects of his creative genius, Beth. 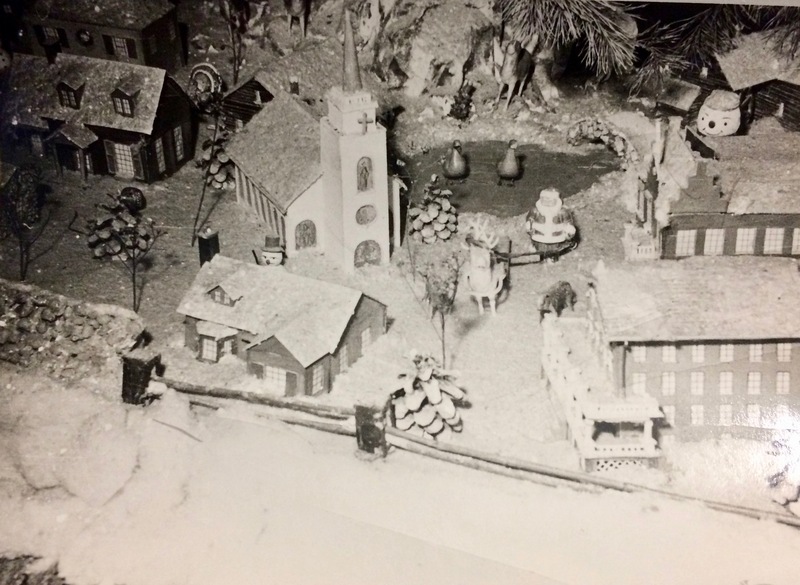 I wonder what a 3D printer could do for recreating the village. What a poignant story. I am so thankful you rescued it and are able to enjoy all the memories and associations with your grandfather. That is beautiful. 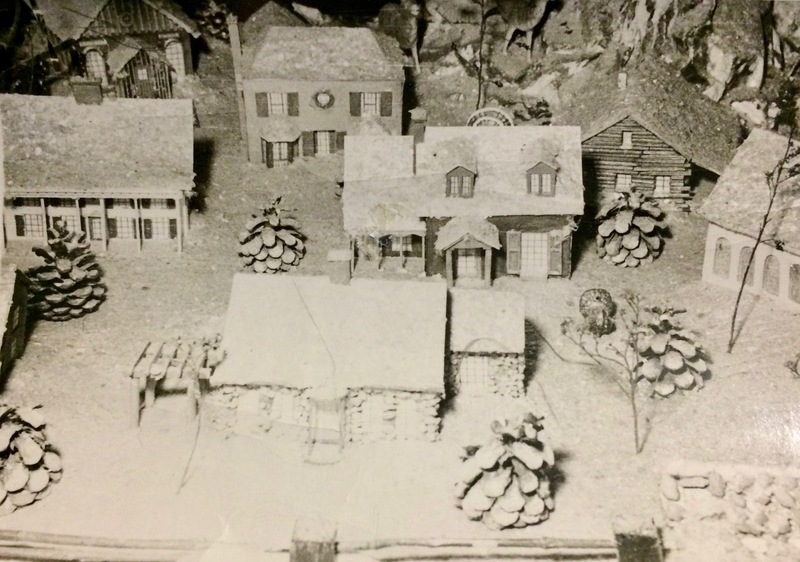 My husband is an architect and he has collected many Dicken’s Village pieces and spends one to two days building mountains and valleys for all of it. He did build mangers for each of our children out of the wood from a childhood tree house and various mosses and weeds from our land. 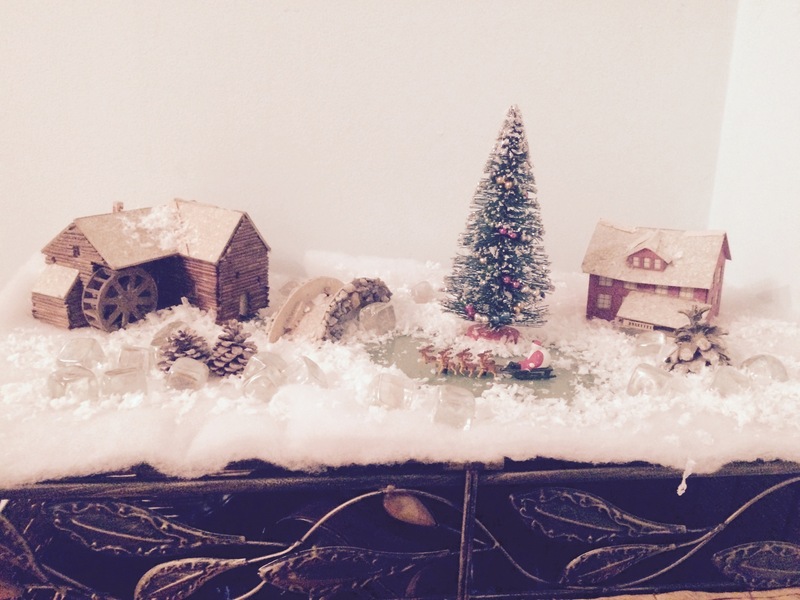 One of our sons went through a bitter divorce and his ex-wife destroyed the manger. So much love and hurt and anger summed up in one thing. A story in itself. Thanks for sharing this. Love the pictures. Poignant, yet lovely to see how much you treasure this amazing treasure. Of course, I love the fact that he was Irish! What an amazing gift he left you all Beth. Like you, I would wonder every time I saw it, about the making of it, the ideas of it. I’m so impressed by this family heirloom. What a great family treasure and tradition; to be shared and past down. We had something similar growing up although not as old as your pieces. They were the thought behind what I try to do for my family now. it is and i’m so glad that you had something like this. it’s wonderful that you’re thinking of these things for your inspiration. Oh, Beth, this is wonderful–bittersweet and touching. Miniatures fascinate me, and the story behind this is like an excerpt from a page-turner novel. Thank you, and Merry Christmas, dear friend. Treasure! Thank you for sharing this with us! Glad you got to keep a small piece of such a wonderful memory. My friend handpainted a snow village for me that we put up every year. It always makes me think of her. LOVE THIS SO MUCH! ROY CONSTRUCTED THE ENTIRE WIZ MOVIE WHEN HE WAS JUST A TEENSY WEENSY KID! i’m so glad you liked it and that is so roy! And in three generations–all is forgotten–lost…so strange this life. yes, isn’t that such a loss? my grandfather died when i was young and i thought that he and the village would always be there. i didn’t yet understand that everything in life is fluid. everyone else remaining, who knew anything about it, my father, mother and grandmother, are now gone and much of the story is lost. Very magical and lovely little village your grandfather made. I remember how fun it was to play with these as a child, and I still love them as an adult. The old photographs are awesome too. Beautiful. Otherworldly. Thanks for the share. What a beautiful keepsake shame some of it has disappeared but thank goodness you saved some of it ….